Five bird species are closely associated with southwestern Washington. Three of these—Red-shouldered Hawk, Black Phoebe, and Western Scrub-Jay—are expanding their ranges into the state from western Oregon. White-tailed Kite is now very rarely seen, while Hermit Warbler is retreating southward as it loses ground to Townsend’s Warbler. Although Red-shouldered Hawks have wintered recently in widely scattered parts of the state, this species is dependable only along the lower Columbia River. A Red-shouldered Hawk first wintered at Ridgefield National Wildlife Refuge in 1991, and others (sometimes two or three) have wintered there each year since then. Individuals are now being found at Ridgefield NWR with increasing regularity in breeding season as well. Although nesting is suspected, it has not been confirmed. There are also both winter and summer records for Red-shouldered Hawk downstream at Julia Butler Hansen National Wildlife Refuge, near Cathlamet. 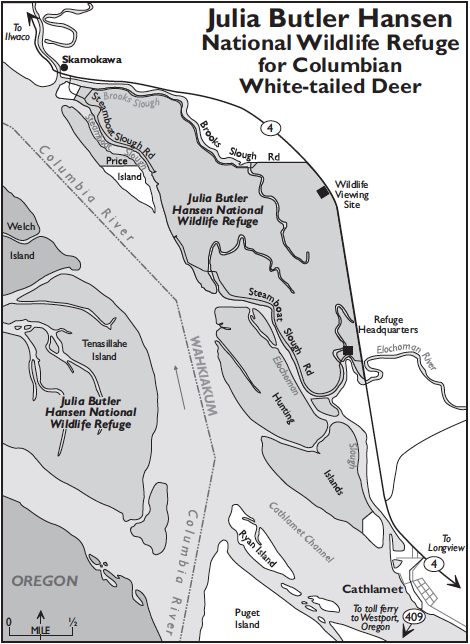 This refuge was established in 1972 specifically to protect and manage the endangered Columbian White-tailed Deer. Although distant from other sites described in this chapter, the refuge is definitely worth a visit if you are on your way to or from the coast. Habitats include tideland Sitka Spruce forest, riparian woodland, tidal and freshwater wetlands, and open fields, making for a diverse and abundant birdlife. Two miles north of Cathlamet, turn west from SR-4 onto Steamboat Slough Road. This road has been undercut by the Columbia River after 2.7 miles where it now dead ends. A new dike is being constructed farther from the river that will provide tidal habitat. Especially numerous are Cackling and Canada Geese (various subspecies) and other waterfowl. A variety of raptors are conspicuous. The riparian woodlands have the usual assortment of wet-forest passerines. Return to SR-4 and go two miles northwest to Brooks Slough Road. Turn left and in 2.6 miles left again on the other end of Steamboat Slough Road to its terminus. There is excellent birding in all seasons along this route. At the time Birds of Washington was published in 2005, only six records of Black Phoebe in Washington had been accepted, mostly found during the winter. Since that time, the population has expanded greatly northward into Washington, with breeding first documented in 2011 and annually since. Although all three phoebe species found in the U.S. are migratory and the first flycatchers to arrive in late winter or early spring, the Black Phoebe is mainly a resident species across its range. The mild yearlong climate of the Pacific coast is conducive to post-breeding dispersal to the north, with increased winter occurrence likely a result of climate change. While this species occurs somewhat randomly in counties west of the Cascades with five to ten records annually since 2010, by far the most likely areas are along the lower Columbia River in Clark, Cowlitz, and Wahkiakum Counties. Nesting was documented in closed areas of Ridgefield NWR from 2011–2013 with young fledged from two different nests each year (including 20 nestlings that were banded in 2012 and 2013). “Resident birds” were seen from October 2010 to February 2014 before they disappeared from that location after a period of harsh weather. Coincidentally, a suspected breeding pair was found across the Columbia River in St. Helens, Oregon during the spring of 2014. Nesting also was documented near the office at Julia Butler Hansen NWR in 2014, and nesting was assumed the year before. All nests were found on man-made structures. With increased spring sightings recently in the Puget Trough, this breeding expansion north is likely to continue. Post-breeding movement seems associated with the presence of open water, with running water probably a key factor in winter survival where insects can be found even with ponds frozen. Some likely areas are at the two refuges where nesting is documented, especially along channels where tide gates are present or water is pumped from drainage ditches in diked lowland areas. Places with access and suitable habitats near the Columbia River include: River S Unit of Ridgefield NWR along Bower Slough, Julia Butler Hansen NWR near headquarters and the Columbia River levee, Puget Island south of Cathlamet, Woodland Bottoms along Dike Road, Vancouver Lake and lowlands along Lower River Road, and the Willow Grove area west of Longview south of SR-4. Western Scrub-Jay is the most widespread of the five species, though rarely numerous. Once confined to the Vancouver Lowlands, for the last 60 years it has been pushing slowly, inexorably northward up the lower Cowlitz Valley and up and down the Columbia. Western Scrub-Jays are now fairly common year-round residents at lower elevations in relatively open landscapes (towns, open woods, edges) throughout southwestern Washington, north to Tacoma, west to the coast, and into the eastern Columbia Gorge and up to Yakima. They are breeding north to Bellingham. Western Scrub-Jays favor Garry Oaks when available—for example, at Ridgefield National Wildlife Refuge (page 240)—but are not tied to them. These jays are still enough of a novelty that Washington birders look for them when visiting the Southwest. White-tailed Kites were steadily increasing in numbers through the mid-2000s. They nested locally in the interior Southwest as well as along the South Coast. The first nesting record was in Raymond in 1988. Up until the mid-2000s, they were seen, most commonly in winter, hunting the rank grasslands at Julia Butler Hansen National Wildlife Refuge, and also as far up the Columbia as Steigerwald Lake National Wildlife Refuge. Farther north, they were occasionally seen on some of the glacial outwash prairies that dot the lowlands between the Chehalis and the Cowlitz Rivers, from Centralia to Toledo. However, since 2010, the White-tailed Kite is notable mostly for its absence: they have nearly disappeared from the state. Two consecutive harsh winters are suspected as the reason. Whether the species will make a return is unclear. Hermit Warblers inhabit Douglas-fir forests on the east and south slopes of the Olympic Mountains, on the west slopes of the Cascade Range south of the Cowlitz River, and southward and westward through the Willapa Hills. Their range is contracting as they are being displaced by the competitively superior Townsend’s Warbler, which is advancing from the north and east. The two species meet along narrow, moving hybrid zones in the eastern Olympics—for example, near Quilcene (page 216)—and the southwestern Cascades. During the nesting season, use caution in identifying either species anywhere along the west slopes of the Cascades between White Pass and Mount Adams—for example, around Takhlakh Lake (page 256) and Indian Heaven (page 255). Hybrids may be seen farther afield in post-breeding dispersal or fall and spring migration, but rarely east of the Cascade Crest or north of Puget Sound. Most hybrids have yellow faces and therefore are mistaken for Hermits, while the smaller share of hybrids that have black masks are usually called Townsend’s. It is important to check multiple characteristics. “Good” Hermits have gray (not green) backs and pure-white underparts with no yellow below the bib, no streaking on the flanks (a touch on the lower flanks is OK), and a white gap between the bib and the back. “Good” Townsend’s have a solid-black crown (yellow in Hermits except for a small amount of black approaching the nape), heavily streaked flanks, and a bright yellow breast; the black bib corners reach the green back. Hybrids cannot confidently be separated from either parent species by song. If you want an identification challenge, drive some of the forest roads north, east, and south of Packwood, on US-12 about 20 miles below White Pass. This is smack in the middle of the hybrid zone, and you may see Townsend’s, Hermits, and everything in between. Singing birds often come down to taped playbacks of their songs, affording close looks. Phenotypically pure Hermit Warblers can reliably be found on the south side of Mount Saint Helens (page 216) and also in the Willapa Hills—for example, at Capitol State Forest near Olympia (page 211). Go exploring for Hermits on your own in the lightly birded hills farther south. They have been reported singing high in the canopy in the mature Douglas-fir, Western Hemlock, and Western Redcedar forest at Rainbow Falls State Park. From Exit 77 on I-5, take SR-6 west about 16 miles to the park entrance (Discover Pass required). The rushing waters of the Chehalis River provide good habitat for American Dippers and a scenic spot to picnic.